Microsoft's Windows 8 is a radical design break from Windows' past. For all of its radically redesigned features -- and in part because of them -- Microsoft's Windows 8 won't be an instant success. The latest update to the world's most popular operating system goes on sale Friday. Microsoft has high expectations: CEO Steve Ballmer said in July that he expects Windows 8 to kick off "the most epic year in Microsoft's history." Steve Sinofsky, Microsoft's Windows chief and heir apparent to Ballmer, speaks of "reimagining Windows" to create "a new PC experience." Windows 8 may be the operating system of the future, helping Microsoft (MSFT) make up for past mistakes that left it well behind chief rivals Apple (AAPL) and Google (GOOG), especially in the mobile computing field. But for the near future, all signs point to buyers taking a wait-and-see approach. The vast majority of Windows sales come from new PCs, and both Wall Street and industry analysts think that PC sales in the fourth quarter will be very weak. Intel (INTC) said last week that it expects holiday PC sales to grow at half their usual seasonal rate. The industry doesn't expect Windows 8 to jump-start PC demand. Gartner analyst Mikako Kitagawa thinks it will have "no effect" on sales. New Windows releases sometimes motivate consumers with aging PCs to upgrade, but that's unlikely this time around. Those with older machines running Windows XP, Vista or 7 are still expected to wait on the sidelines, despite Microsoft's ultra-low, $40 Windows 8 upgrade offer. The main reason: For the first time since Windows 95, there will be a learning curve associated with the new version of Windows. It has a radically redesigned user interface and a series of new, gesture-based commands for interacting with apps. On a touchscreen device like a tablet, it's pretty intuitive, but with a mouse and keyboard, it can be awkward. The completely different look and feel could turn off some buyers. "Consumers going into the store for a PC will be shocked and possibly disoriented by what they discover on the shelves," said Michael Silver, analyst with Gartner. "Users hate change, and won't embrace a new user interface without at least a basic sales pitch. Consumers may be forced to accept it, but they will be more critical and more likely to find fault with the approach." That goes for business customers too, who will require training, says Vijay Rakesh, an analyst with Sterne Agee. Many corporate customers, which typically skip versions of Windows, won't be using Windows 8 at all. The majority upgraded to Windows 7 over the past few years and could choose to simply wait for Microsoft's next release. "Windows 8 stands a very real chance of gaining only limited uptake in corporate environments," said Silver. "The drastic changes in Windows 8 leads us to predict that most organizations will be hesitant to deploy it broadly, especially to users that won't have hardware that takes advantage of touch." Gartner expects Windows 8's launch to be much weaker than Windows 7's, even though Windows 8 is launching during the holiday season. (Windows 7 went on sale in July.) Next year is expected to be slow as well: Gartner anticipates sales of the new operating system coming in 6% lower than the first full year of Windows 7 sales. Here's another kicker: Windows 8 won't end Windows 7's strong run. A year after Windows 7 went on sale, the previous version -- Vista, Microsoft's biggest disaster -- sold on just 53 million new PCs. But there will be 168 million new Windows 7 PCs sold next year, Gartner forecasts. 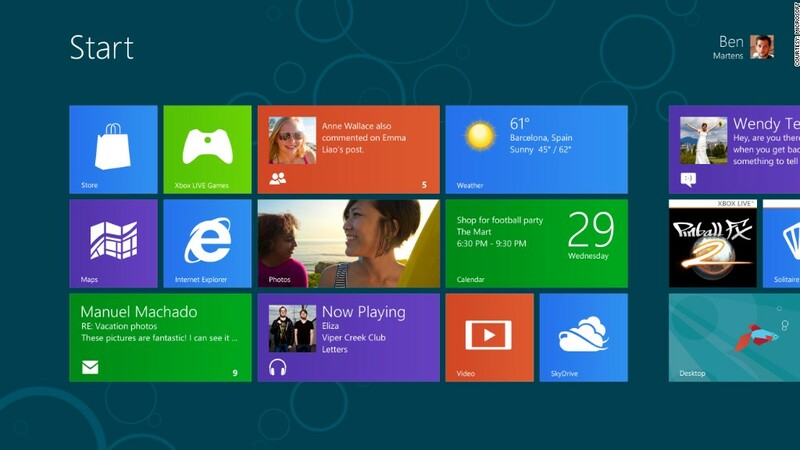 Windows 8 is not expected to significantly disrupt Windows 7 sales until 2014. "Adoption is going to be slow," said Frank Gillett, an analyst at Forrester Research. "Microsoft is making appropriate, significant changes to Windows, but it's going to be challenging for customers to embrace it wholeheartedly. It will be a rough year -- not just a rough quarter -- for Windows 8." Microsoft's giant marketing machine missed an opportunity to get the positive message out early about Windows 8, Gillett thinks. The company hasn't advertised the new operating system ahead of its release, which Gillett said could have prepared users for the new look. As a result, it will take time for customers to digest just how radically different it is. Even if Windows 8 isn't an instant success, most analysts expect it to sell well over the long haul. Windows is the most ubiquitous operating system in the world, after all. But is this the operating system that will turn every kind of device into a PC, including tablets? That's what Microsoft is hoping. Faced with stiff competition from Apple and Google, though, Microsoft might have to wait until the next version of Windows to really make a dent. "Ultimately, Windows 8 will sell well," Gillett said. "But it won't blow the doors off."